with a beautiful garden, near the center of Gordes, 500 m walk easy in 5 min. No possibility at all for any extra person or extra bed, sorry ! The little House is 50 m², with a sitting room-dinning room, a little library, a nice bedroom with a KING SIZE BED (1,80 m x 2 m) , a kitchen and a bathroom and toilets. The parking is enclosed inside the property next to the rental. then you are really separate and quite and peaceful. You have a nice garden and terrace, with 2 Sun beds with mattress and sunbath Towels. PINK HOUSE IN GORDES: In GORDES, the 'PINK HOUSE' is a charming little house, with Terrace and Garden, but no pool facing the beautiful Luberon Valley. Enclose by typical Gordes old stone walls, the 2500 m² grounds that surround the ''Pink house'' and keep it very quiet and pleasantly secluded. Gordes was the Village that inspired many very famous artists and painters in Provence since 1947, because its awesome beauty. Gordes is selected as one of the most Beautiful hill-top villages in France. This ''Pink house'' is separate but next to another House. The provencal Garden, with lots of shady tree, terrace, and a wonderful small old box-tree garden 'à la Française'. This ''Pink house'' gives you calm and peace. In GORDES - The 'PINK HOUSE': This 'Pink Hous is located in the heart of a large Property walking distance from the center of GORDES. The area of “Gordes” is one of the most calm and appreciated. Situated near the heart of the town of Gordes , just away enoughfrom the tourist and the traffic roads. a real taste of the Provençal and French lifestyle. Very charming and fully furnished the PINK HOUSE is giving onto the private garden. Very calm and bright, this PINK HOUSE has an ideal location. It is located inside the owners property but with a real Privacy. - A living room with a dining table facing the garden and comfortable armchairs. - Bathroom with shower, Towels, Towel Drying heater, WC. VISITS, REGION, VILLAGES, AREA: Abbaye of Sénanque , Ménerbes, Bonnieux, Lacoste, Roussillon, Lourmarin, Oppede-le-Vieux, Isle sur sorgue, Joucas, are some of the villages that you will discover and enjoy during your stay in Gordes. Aix en Provence, Avignon, Orange, Marseille, Nimes, or Arles are Towns that are very beautiful around here to visit with there Museum and summer Music or Theater Festivals. Also it is wonderful to drive a day to the sea to Cassis and have the boat to visit the 'calanques' on the boat. Also in the period of the Lavender, it is very near to drive to the Sault area where you will enjoy alll the lavender fields. The cottage is set in a beautiful, quiet, well-maintained garden. It is very nicely furnished and the kitchen is fine for making simple meals and picnics. The hosts, Eric and Jean made us feel very welcome and provided us with wine, home-made cakes, soft drinks, and local fruit on arrival. The cottage is cleaned twice a week and everything is in excellent condition. Gordes is a very pretty village and located in the heart of Provence, where you can take a short drive (or walk) to other lovely villages. Many thanks for your great review ! When you are so happy of your stay with us, then we are happy too ! We will be very happy to welcome you back in the Pink House ! What a fantastic property. 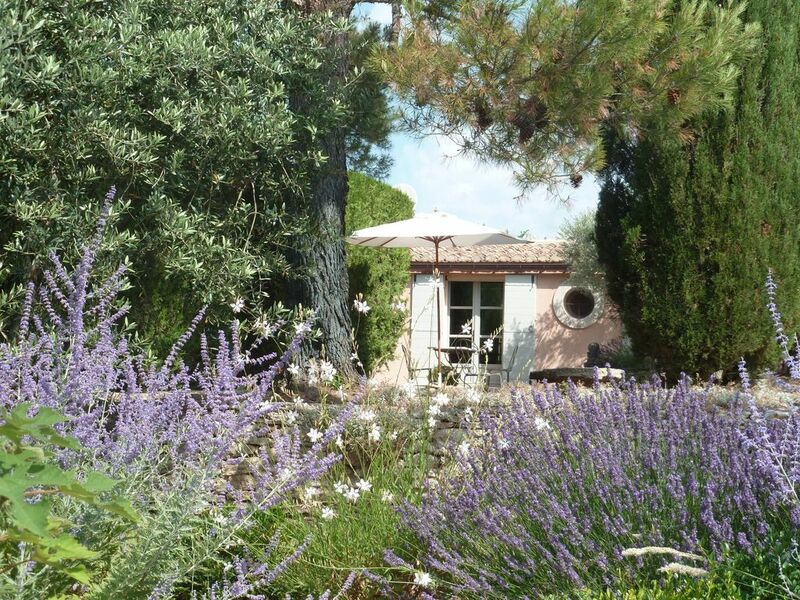 Well appointed and private in the grounds of a superb house on the edge of Gordes. Easy to walk into Gordes within 10 minutes but still private and away from the numerous daytime tourists. Eric and Jean are excellent hosts, very attentive and nothing is too much. A great base to explore the area. What a nice review ! and in the region then we are also so happy ! the great pleasure to welcome you again in Gordes. All the best for you and your family ! My wife and I stayed at the "Pink House" during the 2nd week of our French vacation and used it as a base to enjoy the region. The property is beautiful, and we essentially had a private garden in front of the cottage. Eric and Jean (the owners) were great hosts and always available to answer questions. We especially enjoyed the welcome gift of fruits and snacks and the homemade chocolate cake. They also offered their laundry room for us to use. Parking was easy and secured behind the property gate. The cottage entrance was private, so it was easy to come and go as we pleased. The center of Gordes is a 10-minute, level, walk away along a highway. The hike to the Abbaye Notre-Dame de Sénanque is along some nice trails and not to be missed. We had been to Provence several times before, so we picked our location carefully. Gordes is a beautiful town and was close to the sights we were most interested in, but it is somewhat on the eastern edge of most Provence attractions. In summary, we very much enjoyed the Pink House and recommend it highly. Thank you so much for your wonderful review ! We can read that you keep à good memory of your stay in the Pink House ! And We are very happy to know it, thanks ! When our guest leave here Happy then We are really pleased too ! The future when you wish to continue to explore the région ! Take care and all the best ! Top notch cottage in Provence! My wife and I just returned from an amazing week at the Pink House - we wish we were still there! The house is in a wonderful location, a short walk from the centre of the village (Gordes). The large garden with olive trees and lavender was a wonderful and peaceful place to relax. Eric and Jean were outstanding hosts - they keep the place spotless and were always available if we needed any help/advice. We found Gordes to be an excellent base from which to explore the other local villages/towns - it also had a nice mix of restaurants, bakeries, and a small grocery store. If you're looking for a romantic getaway and a rich cultural experience, we'd highly recommend the Pink House. Thanks for your very positive review ! merci beaucoup ! We really enjoyed to welcome you and just wish to thank you for staying with us in the Pink House in Gordes, and we hope your long trip back to Toronto was good. of their stay in the region, so when you are happy, then we are so happy too ! we are sending you our very best regards from Provence. showed us the lovely place we would call home for one week. and pastries from the local baker in Gordes. The owners are very helpful and attentive without being intrusive. It's the perfect hospitality and charm. towns, villages and whatever you need around. They ares the perfect hosts. was charming, clean and very comfortable. We visited in mid-Sept and the weather was beautiful. The garden is very quite, nicely organized and delightful. The property is about 5 mins walk to teh center of Gordes, very easy walk. to the center of Gordes to the Bakery. The market in Gordes on Tuesday and the one in Coustellet on Sunday is not to be missed. We loved staying here and hope to return again very soon ! La Maison Rose, a real paradise ! Pink Paradise in Gordes ! The Pink House in Gordes is an ideal place to stay when visiting the Luberon. We have been there this year and next year we will come back again. It is unusual in our experience to come back in the same place ! the confort, and it is so clean with very good care of the House. garden and small olive grove for just for yourself to enjoy. we an return and enjoy your breakfast in the garden. the stars at night before retiring. in nearby Coustellet, a short drive down the hill from The House. There is also a very good restaurant, la Coquillade, not far from Gordes. inexpensive, set your lunch menu. a remote valley to Senanque Abbey. all of the footpaths are clear and well marked. Historic Avignon is only 35 minute drive away. If we wish to go further a visit to Aix is a must, as is Cassis. Here are some practical considerations. Over the years we have stayed at many houses all over France, but the Pink House is unique. whether there were any improvements we should like to see for the next year. nothing to add really ! This year we are staying in the Pink House for 2 weeks which says it all. We can recommend highly, but please keep 2 weeks for us ! A Bientot et merci beaucoup ! GORDES is a spectacular Medieval Hilltop village overlooking the Luberon Valley and Mountain and all the other nice villages, Ménerbes, Roussillon, Lacoste, Bonnieux, Oppède, Joucas. The beautiful Abbaye of 'Sénanque' from the 12th century is in Gordes. Nearby you'll find the famous Antiques Market in Isle sur la Sorgue. Very near also, you will discover the nice lavender, near 'sault'. In summer, you will get nice 'Festival' all around, in Avignon, Aix en provence, Orange, Nimes, Gordes, Lacoste, etc. St Remy, Les Baux are also beautiful visit near Gordes, in 'Les Alpilles' area. The Luberon Mountain by itself is a preserved natural Park. Every village has got his own market with the wonderful produce, fruits, vegetables, wines, olive oil, flowers, spices, honey, fabrics. The light, the scenery and the history of that special region will charm you every moment of the day. We will give you the names of our favourite restaurant with special food from Provence and good wines.